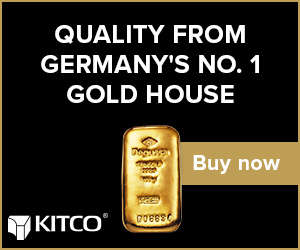 This made me think of whether there is a pattern visible on the charts that could link the current physical gold shortage to the famous gold shortages of the 30s and 70s. During those famous gold shortages, there were gold promises/obligations in existence that would never be settled. 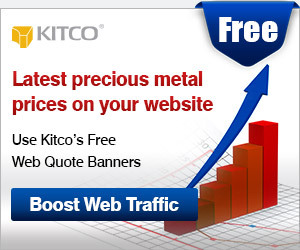 They have still not been settled, and have been instrumental in pushing gold prices much higher. 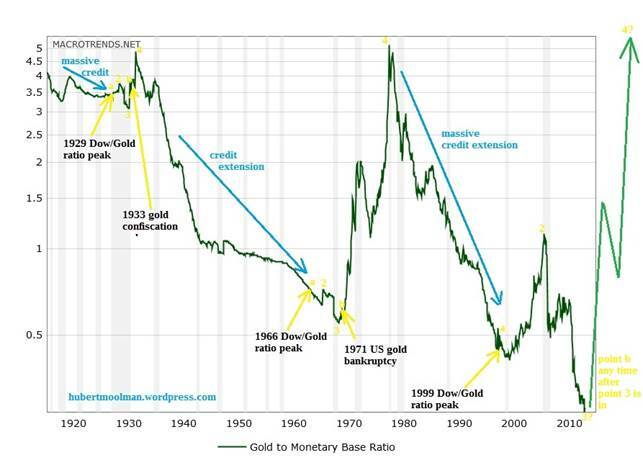 Historically when this ratio was going down, then there are more claims on gold than what was actually being held by the Federal Reserve or US Treasury (for more on this ratio). 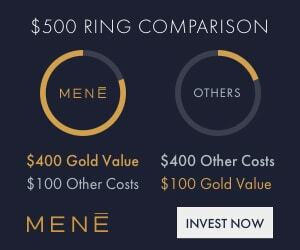 At some point after the ratio is going down there would be pressure to fulfil gold obligations due to the shortage of physical gold compared to claims on gold. This pressure often comes after a significant change in conditions such as after a stock market peak. Just like financial fraud is often discovered when business is slow, as was possibly the case with Bernie Madoff. On the chart, I have indicated the three yellow points (a) where the Dow/Gold ratio peaked. 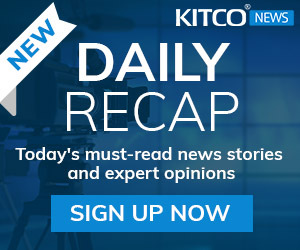 These all came after a period of credit extension, which effectively put downward pressure on the gold price. Points 2 were placed just to show the similarities of the three patterns. After the peak in the Dow/Gold ratio and point 2, the Gold/Monetary Base chart made a bottom at point 3 on each pattern. It is at these points that the monetary base could not expand relatively faster than the gold price increased. Today, this could mean that the point at which the game is up for those who are short gold. I do not know if point 3 is in on the current pattern; however, given the fact that the bullion banks are under pressure as indicated in the spike in the gold coverage ratio at the COMEX, it might well be. Again in 1971, after the relevant point 3, due to being unable to cover all the foreign holdings of US dollars with the related amount of gold, the US suspended (really ended) the convertibility of the US dollar into gold, on 13 August 1971 (point b). So, after point 3 is officially in on the current pattern, we could possibly expect a point b at which a major event in the gold or/and bond market could happen. When this event happen, it might be too late to add to your gold or silver position. It will also prove that gold and silver is still relevant as monetary assets.